Update: I love the web! 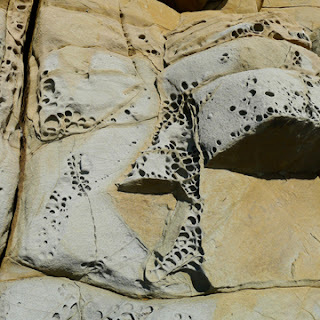 My friend Maureen at Writing without Paper immediately supplied the missing term: tafoni ... also called honeycomb weathering and apparently related to salt weathering. See her response in the comment section. Tafoni (singular: tafone) are small cave-like features found in granular rock such assandstone, with rounded entrances and smooth concave walls. They often occur in groups that can riddle a hillside, cliff, or other rock formation. They can be found in all climate types, but are most abundant in intertidal areas and semi-arid and arid deserts. Currently favored explanations controlling their formation include salt weathering, differential cementation, structural variation in permeability, and the length of the drying period between wettings. They also frequently occur in granitic rocks. 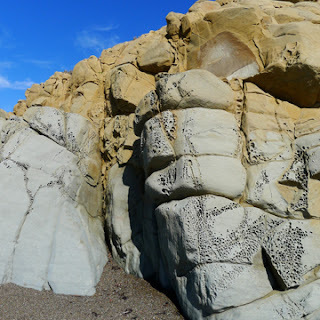 Last weekend I was beachcombing at Moonstone Beach in Cambria, CA, when I found these cliffs with beautiful, lacy holes. Recently I heard the term for this formation but have lost it. If anyone knows what this is called, please let me know. I've been told that it is evulsion or the work of piddock clams, but I think there's a different term for it. Anyone have any ideas? I don't know the term but I sure like the way they look! I think it's the word I shared with you, tafoni. I meant to add that I did not know these kinds of rock formations were in California. I know they're in Canada, because my painter friend Terrill took pictures of them. Not only does the formation look ancient, but it's as though a human put a hand to it, making it some kind of totem. Nature is so full of wonders! I should have known!!! I knew I had heard the term recently ... even before I ever saw it and then, when I was on the beach, there was a shock of recognition. But, I had lost the word. You are a marvel!!! What a delightfully lyrical word! and world of wonder.